The 2012 Mitchell Lecture featured three experts in an increasingly important issue in American life: the growth of home health care and its implications for family structures and the labor market. The unspoken and sometimes uneasy line between human caring and economics formed the basis for this year's James McCormick Mitchell Lecture. The Mitchell Lecture, the Law School's long-running signature event, was titled "When Caring Is Work: Home, Health, and the Invisible Workforce." Held Oct. 19, the event was co-chaired by Professors Dianne Avery and Martha T. McCluskey. This year's lecture featured three experts in an increasingly important issue in American life: the growth of home health care and its implications for family structures and the labor market. Following greetings from Dean Makau W. Mutua, Princeton University professor Hendrik Hartog was the first speaker. A sociolegal historian, Hartog this year published a study of the family strains that historically have resulted when one or more family members assume a caretaking role in the expectation of a later inheritance, called Someday All This Will Be Yours: A History of Inheritance and Old Age (Harvard University Press). He talked about the research that went into that book, for which he read transcripts of 19th and early 20th century New Jersey cases on promised or undelivered inheritances. "I was entranced, still am, by the descriptions of work scattered among the trial records," he said. "There's nothing quite like a description of how it feels to get your hands dirty while giving a stepfather by marriage an enema, or what it means to wrestle a demented aunt to the ground as she destroys the family furniture." The new mobility of American life in that period, he said, meant that many elders were left alone, "abandoned by their ‘real' children and grandchildren. Older people had to make someone else into their child if they had any hope for a happy, that is a cared-for, old age." Hartog detailed two illuminating case studies. The first was the 1903 case of a housekeeper who had been promised one of her employer's three farms if she would stay with him. She cared for him for more than two decades, but was denied that inheritance. A lower court awarded her the farm, but the New Jersey appeals court reversed the award, saying that her caretaking work made her, in the end, simply an employee and not an heir. In the second case, a woman who worked as a rich woman's companion in Bayonne, N.J., for 24 years contested a codicil in the woman's will that left her a mere $100. The appeals court found for the plaintiff, saying the will was fundamentally unfair. The continuing issue, Hartog said, was, "How do you mark the difference between being a servant and being someone entitled to a legacy? … They lived at the same time between two moral universes. In one universe, that of the family household, they earned moral and spiritual rewards, as well as material rewards, by sharing in a common family enterprise. In the other universe, their rights and identities as independent and contractually competent actors took priority. A good plaintiff's lawyer ordinarily worked to cabin a client in the first universe and to suppress the often multitudinous traces of the first. But the complexities of real lives kept leaking out into the testimony, and that made the lawyer's work difficult." The second speaker, Yale University history professor Jennifer Klein, has written extensively about the intersection between labor politics and the welfare state. Her just-published book Caring for America: Home Health Workers in the Shadow of the Welfare State (Oxford University Press, co-authored with Eileen Boris) is a labor history of home health care workers from the 1930s to the present. Klein addressed efforts by home health care workers to unionize, starting in 1977 when 217 home care workers in the Bronx organized a union in protest against what they considered unfair treatment by a city human services agency. "Home aides and attendants perform intimate tasks of daily life, such as bathing, brushing teeth, cooking and cleaning, that enable aged, disabled or chronically ill people to live at home," Klein said. "These essential workers are America's front-line caregivers, but they earn an average hourly wage lower than that of all other jobs in health care and historically have labored without social benefits or even worker's compensation. They labor in private spaces, meeting individual and family needs, but how they do so is a story of political economy that reflects a major shift in the welfare state and the economy that defines contemporary America." More than 1.8 million people are currently employed in home care, she said, making it an industry bigger than the auto industry and the nation's fastest-growing occupation. That, she said, raises some societal issues: "Our longer life expectancy means that more of us will live with chronic illness. The majority of Americans across the spectrum of class and ethnicity will at some point depend upon a caretaker, often one who has long labored in poverty and struggled mightily her own and others' social needs. "The macroeconomic structuring of the occupation, as well as its interpersonal challenges, heighten the stresses of an already emotionally, psychologically intense and economically precarious job. Workers, family members, state administrators and policy makers all wring their hands over the undependability of home care services. For the former, there aren't enough reliable home care workers. For the latter, there aren't enough hours." The final speaker – Professor Peggie R. Smith, who teaches employment and labor law at Washington University Law School in St. Louis – took up the theme of ensuring adequate protections for home care workers. "Between 30 and 50 percent of workers quit their jobs each year," Smith said. "Those rates really should come as no surprise. In a world where work is supposed to be the golden ticket to a host of protections and benefits that will promote our economy and social well-being as well as our health and safety, home care workers are most often cast aside, they are rendered invisible, and they are denied the benefits that so many of us take for granted." As policy makers discuss whether Fair Labor Standards Act protections should be extended to home care workers, Smith said that these workers deserve such support. "Limited public support of long-term care for the elderly has sacrificed the interests of home care workers to satisfy the needs of home care recipients, and in the process it operates to the disadvantage of both groups," she said. "In a caring society, collective responsibility for such care should be vastly preferred to foisting the burden on low-wage workers by denying them the most basic protections as minimum wage and overtime. But that's what we've accepted." She also pointed to state regulations on the provision of home care, saying they fail workers in three areas. A shift to a model known as consumer-directed care, she said, "jeopardizes what few workplace rights are available to home care workers." The growth of matchmaking home care placement registries is more about protecting consumers than workers. And some states, she said, have started to provide funding so clients can hire family members to provide care. "What does it mean to treat family members as employees when you think about the fallout for those home care workers who are not family members?" she said. "You may not insist that the employer comply with the law, and you may not be willing to join in organizing efforts, when the employer is your mom." The presentations were followed by a question-and-answer session and a reception. 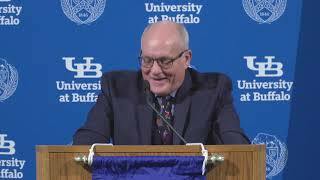 The Buffalo Law Review will publish some of the material from the lectures.